UPDATED: MAR 15, 2019 Murky, milky yellow with a long-lasting huge white head. Malty, yeasty, grainy, sweet fruits, tangerine, lychee, dank, floral, soft carbonation. UPDATED: FEB 10, 2019 330ml bottle. Murky, dark golden colour with average to huge, thick, frothy, moderately lasting and lacing, white head. Floral, grassy, hoppy aroma, notes of grass, weed, fresh hay, oaty background. 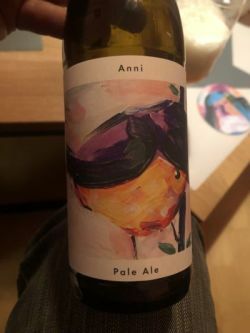 Taste is floral, grassy and fruity hoppy, minimally tart, notes of fresh hay, some weed, slightly disguised hints of nectarine and peach, mango, minimally dry, oaty basis. Smooth and soft palate, well carbonated. UPDATED: JAN 24, 2019 Tap at Naiv Frankfurt. Cloudy light yellowy beer, nice white foam. Light grainy malt base, nice prickly fruity and fresh bitter hop bite. Nicely moreish. Good one. UPDATED: JAN 23, 2019 Cloudy yellow. Aroma is intense lime passion fruit and leaves with a wheaty sour touch leather. Taste is subtle wheaty spices with not much sourness medium umami. Somehow perfectly balanced and drinkable. Very nice. UPDATED: FEB 2, 2019 Tap at Tilmans party. Murky yellow, fruit nectar, offwhite foam. Tropical barnyard, dry hay, leather, mango, Cummin, smoke, dry, light metal, citrus, lemongrass, a bit tea. fresh, pretty great. Bottle 330ml. @ [ Pre-Borefts tasting 2018 ] by kermis in Kim Jong-Un Buurtcentrum Zaandam, Noord-Holland. [ As Flügge Gwen ]. UPDATED: DEC 18, 2018 330ml Flasche. Trüb gelbes Bier, hoher luftiger Schaum. Intensiver fruchtiger Duft. Citrusnoten, Hopfen, Kräuter. Im Antrunk Fruchtsäure, Kräuter, Aprikose, Limette, Grapefruit. Sehr langes fruchtiges Finnish. Großartiges Bier mit nur 5%!